Make no mistake, there are plenty of winners and losers on draft day, but the greatest tension for analysts and fans alike is the long drawn out time table for when an impact player may hit the field on a given team. So it’s equally important to consider what factors eliminate a team from being the ultimate draft day winner. Teams like New England who drafted essentially for 2015 or Kansas City and Cincinnati who drafted for value and depth can’t take the belt this year. So we are looking at three factors. We are looking for teams that fill multiple needs namely at impact positions .Teams that achieved more draft day success than their divisional opponents. And teams that drafted effectively enough that they improve on their record from 2013. Here are two teams that failed to meet the above criteria and will predictably be cashing in their chips by week 5. The New York Jets are a true testimony to how far a stingy defense can carry a team in a mediocre division, but they failed to address the WR position adequately and although Jace Amaro is a stud, Erik Dekker cannot be depended on as a reliable #1 receiver. Furthermore, Buffalo, New England and Miami all held serve by building adequate depth and even trading up where necessary. No team blew it more than Tampa Bay. Expectations are high for a Lovie Smith coached team, but drafting ZERO defensive players after losing Darelle Revis is puzzling. Combine that with decent drafts by Carolina, New Orleans and Atlanta and the Bucs may take a step back before moving forward with the new coaching regime. Before determining the winner we have to give honorable mention to both Cleveland and Oakland. Both teams drafted a high end impact player and a QB. The jury may be out for a while on Johnny Manziel, but Cleveland’s first 5 picks could all see significant playing time, even Terrence West who knows how to score. Putting them in first is difficult because it seems like only a matter of time before owner Jimmy Haslam and Brown’s management fail to get out of their own way and mess everything up… again. Both team’s divisional opponents didn’t seem to light it up either. That leaves us with the Jacksonville Jaguars as this year’s 2014 draft winner. 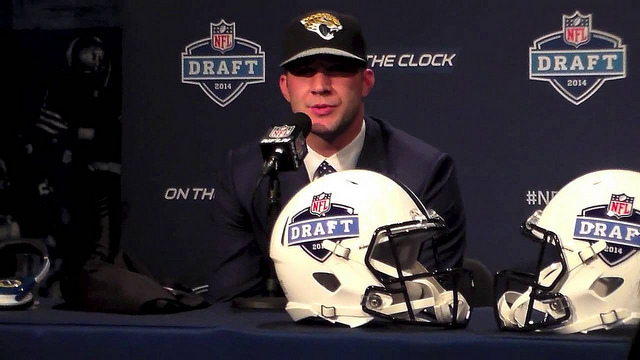 Drafting Blake Bortles is no more of a risk than drafting any of the signal callers drafted in the first four rounds of the draft. But Jacksonville’s implementation of a clear draft strategy to perfection is what’s going to turn heads in the years to come. They drafted a Florida native with their first pick, don’t think that wasn’t intentional. Then they followed that up with two stud receivers to complement the one’s they already had. They then proceeded to draft a guard to help protect Bortles, which also complements other free agent acquisitions this off season. I’m not crowning the Jags Super Bowl champs anytime soon, but there’s no question they made some serious moves in this year’s draft which will make them more competitive down the road. Combine that with the less than impressive drafts of their divisional opponents and it’s evident that Jacksonville Jaguars are at the top of the list of this year’s draft winners.